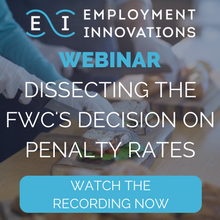 Peter Ferraro (Managing Solicitor at Employment Innovations), will dissect the Fair Work Comission's recent decision on penatly rates and go into detail on how these changes affect you as an employer across the affected industries - Retail, Fast Food, Hospitality, Restaurant, Registered Clubs and Pharmacy. What was actually decided in the Penalty Rates decision? When will the changes to penalty rates take effect? What does this mean for things like enterprise agreements, employment contracts and individual flexibility arrangements? What can employers do to take the most advantage of the changes? Employment Innovations is Australia’s leading employment solutions provider, specialising in Employment Law & Migration, Human Resources, Payroll, Outsourced Employment, HR technology and Recognition & Incentives. For over two decades, we have worked alongside Australian businesses to provide comprehensive employment solutions that make being an employer easier. We understand that businesses rely heavily on their employees and that engaging, paying and managing staff can be a complex and often burdensome process for busy employers.